All while learning everything you need to know to improve your photography skills, sell your images, and earn an income from your vacations, so you can start enjoying the freedom, independence, and travel opportunities that freelance photography delivers. And feel the pride and prestige that comes with seeing your photos—along with your name—spread across the glossy pages of travel magazines or on top stock photography sites. Over seven adventure-filled days in the UNESCO World Heritage Sites of Cusco and Machu Picchu, you’ll photograph and explore some of the country’s most dramatic locations in the company of a professional photographer ready to share his hard-won insights and secrets. From its breathtaking natural landscapes to its charming people in their vibrant hats and shawls, this is a place that will tug at your heart-strings… and have you pointing your camera at every turn. 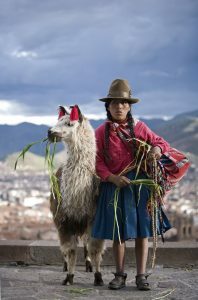 I assure you, not only will you come away with a real passion for Cusco, Machu Picchu, and the villages of Peru’s Sacred Valley – having discovered them with a photographer’s eye – but you’ll also learn all the ins and outs you need to take amazing photos… and sell them. The bottom line is this: you don’t need an expensive camera to take magazine-quality photos, and this May 11-18, 2018 in Peru, we’ll show you exactly how it’s done. Whether you have little experience and modest equipment or you’re already a talented amateur photographer, this expedition will give you everything you need to establish yourself as a true pro. Attendees of these live workshops boast great successes—and you needn’t have a lick of experience to join their ranks. All you really need is a passion for exploring the world (even your own backyard), camera in hand. Efrain’s presentations on selling and reselling your photographs include everything from taking the right kinds of photographs… to knowing and understanding which market will be most likely to buy them. Programs like this one in Peru boast an unbeatable track record—it really does propel people from amateur to pro, fast. Take Lynnia Allison. She attended our workshop in The Bahamas, and one month later, displayed some of her photographs at a local gallery exhibit and sold four at $500 apiece. And there’s Sue Wright, who attended our workshop in Paris and sold more than $1,500 worth of photos within three months of returning home. They both paid for their workshop fees in short order, and the skills they used to do it are the same ones you’ll learn in Peru this May. “These workshops are a wonderful opportunity to travel to a new locale and explore while learning a new skill.” — Sandra M.
“I would definitely recommend this workshop to others. It’s a great way to explore a city and one’s own creativity.” — Heather G.
Instructor Efraín Padro is a professional photographer specializing in travel, nature, and architectural photography. Born and raised in San Juan, Puerto Rico, Efraín has photographed in diverse locations such as Europe, South America, Mexico, Asia, India, and the Caribbean. 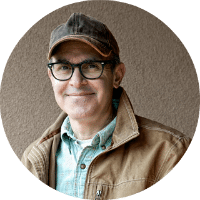 His work has appeared in Travel + Leisure, Frommer’s Budget Travel, Condé Nast, and other publications, and he is the author of The Photographer’s Guide to New Mexico. Not to mention that he has led our previous Peru expeditions, taken personal trips to Peru, and sold images from his experiences there. He knows where to be—and when—to catch things in their best light… and, he’ll walk you through his own processes, step by step, from how to compose a professional, eye-catching photo to how to go about selling it as editorial, on stock sites, or even as fine art. “Efrain is very knowledgeable and easy to talk to. He explains everything so that you understand, and he has a lot of patience.” – Linda B. “Efrain was wonderful—so easygoing and helpful. He spent so much time helping everyone one-on-one. He also has a great teaching style. He’s super humorous. I loved him!” – Lynn M.
“Efrain is very knowledge ­able, approachable, very involved with students and willing to share his secrets. He gave the best tips of the trade.” – Joy S.
“Efrain made this trip perfect in every way. His knowledge and teaching was what I need to improve some areas in my skillset. He knew the best places to take us and the best shots to set up for.” – Joann W.
“Efrain was an excellent instructor both in the field and the classroom. He has a great sense of humor and seems relatable to all levels of photographers. His advice on breaking into the travel market and submitting to magazines was very valuable.” – Terry G.
“Efrain Padro is a 10! He is a very dynamic speaker and brought great new knowledge and ideas on getting published.” – Sarita S.
From Hacienda-style lodges in Ecuador… to luxury tent camps on the Serengeti in Tanzania… casas particulares in Cuba… or a luxury boat in Ha Long Bay… our choice of lodging might just be your favorite part of the trip! We like to explore something the average tourist might not know about. We’ve made connections on the ground so we can visit the best sites, markets, festivals, restaurants, cafés, and villages that would be hard to find on your own. We’ll use local guides where possible instead of well-advertised companies and we’ve geared our schedule toward photographers or writers, so you can skip right to the heart of Peru and capture something the regular tourist never will. On a camera-in-the-hand, boots-on-the-ground expedition like this, you’ll learn in a fun way… among new friends… and absorb the skills faster than you could ever imagine! You’ll draw inspiration from the ancient beauty, dramatic landscape, and people around you… and, return home with a whole new set of skills and the insight to capture the special photo opportunities you can sell again and again… including those in your own hometown. With professional help every step of the way, you’ll go from capturing iconic Machu Picchu at sunrise to the snapping photos of ancient ruins in the Sacred Valley of the Incas… experiences most people only dream about. And create long-lasting friendships and memories you’ll cherish for the years to come. The former capital of the Inca Empire and a UNESCO World Heritage Site, Cusco is known for its mixture of Inca and Spanish Colonial architecture, churches built on top of ancient granite walls, and narrow cobblestone alleys leading to charming neighborhoods. Using our hotel as a base, we’ll explore the city’s inner core and photograph the many nearby attractions, including the Plaza de Armas, flanked by magnificent churches; the Koricancha, whose interior was said to have been covered in gold; and the mighty Inca fortress of Sacsaywaman, with its massive granite walls. From Cusco, we’ll also take day trips in our private transport to the colonial village of Pisac to visit and photograph its Sunday market as well as Inca ruins; to the weavers’ village of Chinchero; and the colonial town of Maras, home to the Inca salt mines. Before taking the train to Machu Picchu, we’ll spend an evening in the quaint village of Ollantaytambo, where narrow passageways through stone wall buildings and past babbling irrigation channels will make you feel as if you’ve stepped back in time. In the morning, we’ll take the train through the spectacular river gorge where the Vilcanota River cuts its way down toward the Amazon, ending our ride in Machu Picchu Pueblo, the village located below Machu Picchu. As a special treat, we’ll spend one night here instead of visiting the site as a rushed day-trip like most tourists. And, unlike most travelers, we’ll get to visit Machu Picchu TWICE—once at sunset and once at sunrise—to be sure we get the shots we need (and in case fog moves in during one of our visits). You will be blown away by this world-class site at different times of day. It’s safe to say that while exploring Cusco and Machu Picchu, you can’t help but find something to photograph everywhere you look. And that’s why we have chosen this unique destination for our photography workshop this May. By the time your trip comes to an end, you’ll be dazzled by your own photos… and so will your friends (not to mention photo buyers) when you get home. You’ll find this expedition fast-paced and fun, and you really will see this destination in a way you never could as a regular tourist. We have a full itinerary planned for each day and most of the workshop will be done out and about on foot, so you’ll need to be prepared for high activity throughout the week. You’ll benefit from unique, one-on-one instruction on a daily basis, both during shoots and in your review sessions. It’s this kind of learning experience that can improve your skills in record time. And you’ll learn about which types of subjects sell best for editorial in magazines, including architecture, people, landscapes and still life (food, signs, etc.). Almost every day, there’ll be a photography lesson or special group photo reviews, where you’ll learn what you’re already doing well and what you can do to improve your photos and ramp up your success. Whether you have little experience and modest equipment or you’re already a talented amateur photographer, you’ll benefit immensely from this expedition. Efrain will provide you with the insights you need to really put your camera to work for you. And, once you’ve captured the shots you want… how to sell them. We’ll meet in the afternoon in the hotel lobby to enjoy a cup of coca tea and get right down to business. After introductions, an overview of the upcoming schedule and looking through some of Efrain’s favorite shots of Cusco, you’ll be eager to get out and explore. But before you do, he’ll take you step-by-step through the right camera settings and show you how you can use your camera to turn an average vacation snapshot into a photo worthy of wall space and a magazine cover. Later in the week, you’ll also learn what you need to be a magazine travel photographer… and how to go about finding a market for your photographs. This morning you’ll walk across the street from the hotel to reach Qorikancha—or the “Temple of the Sun.” You’ll enjoy playing around with your camera at the most important place of worship in the Inca Empire. The Inca temple was converted into the Church of Santo Domingo, but the interior still features the best example of Inca architecture in South America. 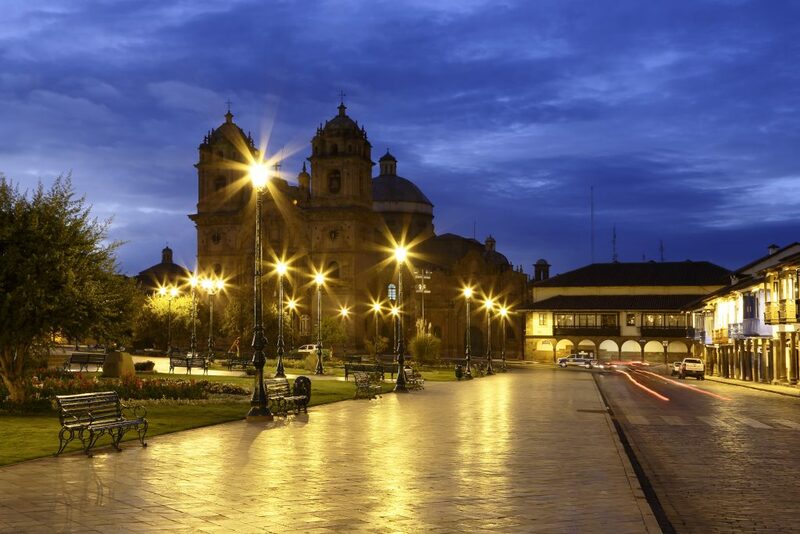 Afterward, you’ll wander with the group through the cobbled streets of Cusco, where Spanish Colonial architecture meets the ancient Inca walls. Next, we’ll take a short ride to the Inca military fortress of Saksaywaman, located high above Cusco. Made of massive granite stones weighing up to 125 tons, Saksaywaman boasts a double wall in a zigzag shape, a large ceremonial plaza, and spectacular views of Cusco and the surrounding mountains. This morning, we’ll head to the charming colonial village of Pisac to photograph its colorful Sunday Market, featuring both an artisans’ market and a locals’ market. Here you can feast your eyes (through your lens) at alpaca clothing, carved wooden figures, and leather goods in the artisans’ market… and you’ll find fresh fruit and vegetables, flowers, dyes, and more among the locals’ offerings. 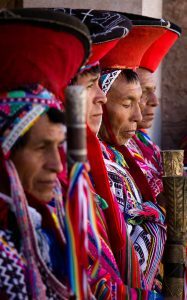 Pisac’s Sunday Market is also a great place to photograph Quechua Indians dressed in traditional clothing and even get a glimpse of local elders as they arrive at the church for a mass in the Quechua language. You’ll also find some pretty special gifts for friends and family back home. After lunch, we’ll make our way to the Inca ruins above town. Best-known for their agricultural terraces, the Pisac ruins also boast a ceremonial center, temples, and spectacular views of the Urubamba Valley below. After our visit to Pisac, we’ll make our way to Ollantaytambo and check into our hotel, taking some time to rest and relax. This morning we’ll explore the quaint village of Ollantaytambo, the best example of Inca city planning, featuring narrow cobblestone streets flanked by Inca granite walls. Inhabited since the 13th century, “Ollanta”, as the locals call it, is located in the shadow of the Ollantaytambo Ruins and represents the only place where the Incas won a major battle against the Spanish conquistadores. Here you’ll climb the ruins’ terraced hillside, visit its temples and housing complex, and enjoy panoramic views of the town below and the Urubamba Valley. 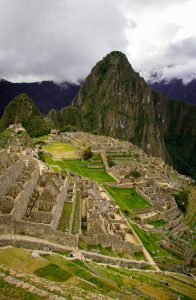 In the late morning, we’ll hop a train to Machu Picchu, a UNESCO World Heritage Site and the best-known archaeological site in the continent. Our 90-minute train ride will take us through the spectacular river gorge as the Vilcanota River cuts its way down toward the Amazon. Our ride ends in Machu Picchu Pueblo, formerly known as Aguas Calientes, a small village with a funky vibe that serves as the base for visitors to Machu Picchu. While our bags are transported from the train station to the hotel, we’ll take a bus to Machu Picchu—the fabled Inca city that was never found by the Spaniards and virtually forgotten until its “rediscovery” in 1911. Inside the citadel, you’ll spend some time photographing the site’s many ancient temples, housing complexes, plazas, tombs, baths, and more. This morning, we’ll be up early to catch the very first bus to Machu Picchu. 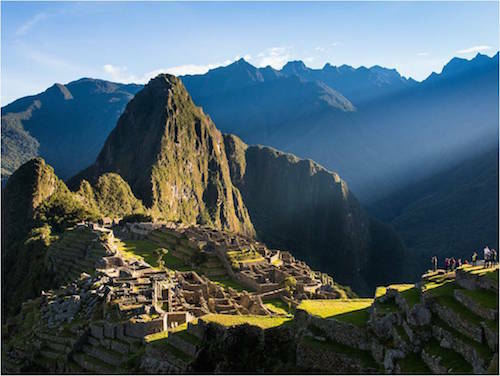 You’ll get to experience the awe-inspiring beauty of Machu Picchu at first light from the famous overlook offering the “classic” view of the ancient ruins. After a full morning of exploring and photographing Machu Picchu, we’ll take the bus to Aguas Calientes to explore the local streets and grab some lunch. In the evening, we’ll return to Cusco and relax at the hotel. FREE DAY. In the late morning, we’ll meet for our final photo review, followed by a presentation on how to get your work published in magazines, with tips from Efrain on how to find magazines, how to approach them, how to submit your work for maximum impact, and more. After, you’ll be free to explore Cusco on your own, do some shopping, explore local churches and ruins, or simply relax at the hotel. Our staff will have plenty of recommendations for you if you’re looking for more activities. 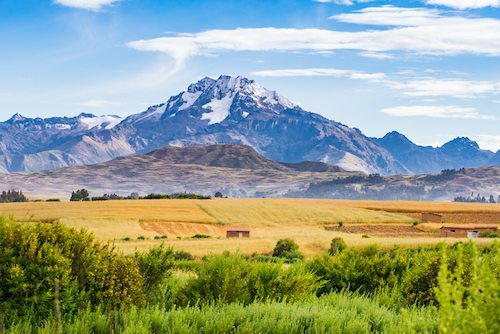 This morning, we’ll drive about 30 minutes to the Village of Chinchero for a weaving demonstration by Quechua women artisans. The weavers will explain how they prepare, dye, and finish the wool, how they make soap, and more. You’ll be free to photograph the entire process. 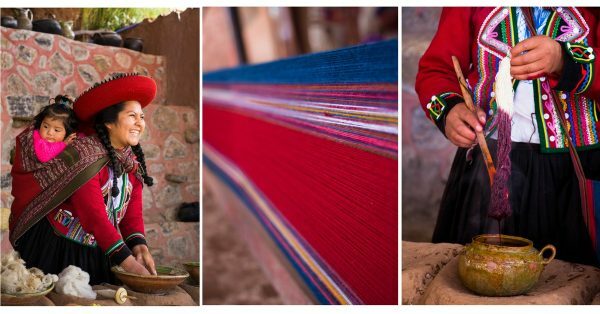 Afterward, you’ll have the opportunity to buy some of their beautiful textiles directly from the artisans. 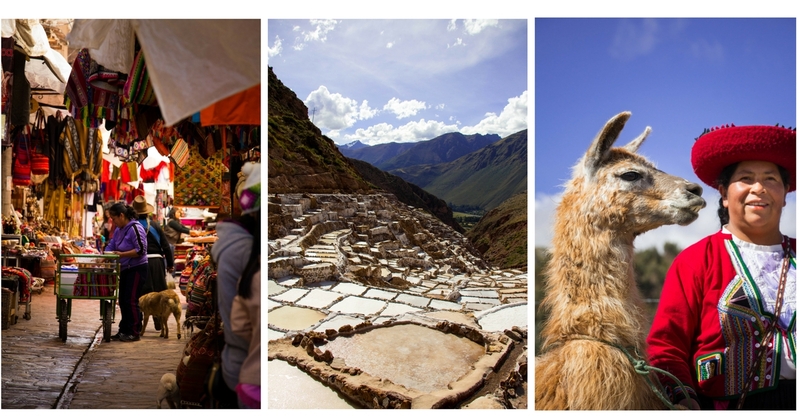 After visiting the weavers, we’ll drive to nearby Maras and enjoy lunch with a local family in their home, followed by a visit to the Inca salt mines—thousands of above-ground salt pools, dating back to pre-Inca times. We’ll even have a chance to buy some salt from the mine while we’re there. After our trip to Maras, we’ll drive back to Cusco, arriving in the late afternoon. In the evening, we’ll get together for our group farewell dinner (on us)! On this day, you’ll fly home from Peru, or extend your visit in this extraordinary country and do some exploring on your own. Note: Schedule and instructors are subject to change. Special Early Bird Discount: Save $250 with your Early Bird Discount when you sign up today. The full price of this workshop is $4,997 but you’ll pay just $4,747* when you apply the $250 Early Bird Discount and register today. If your spouse or a guest would like to join you, he or she can do so for just $4,347. Easy Payment Plan: What’s more, if you’d like to take advantage of our easy payment plan, you can register today for just $999 down. Reserve a seat on the expedition for just $999 when you put your name on our attendee list today. We’ll bill your credit card $999 today, and spread the rest of the payments out comfortably between now and when the workshop starts in May (one payment per 30 days). There are no additional fees for taking us up on this easy payment plan. Pre-Event Guidance from Great Escape Publishing staff, including what to expect, what to pack for the weather, equipment list, travel tips, and more. Tips for tour guides and bus drivers (tipping is at your discretion, but I usually budget $20-$25 USD for a great tour guide, and $5-10 USD for bus drivers). 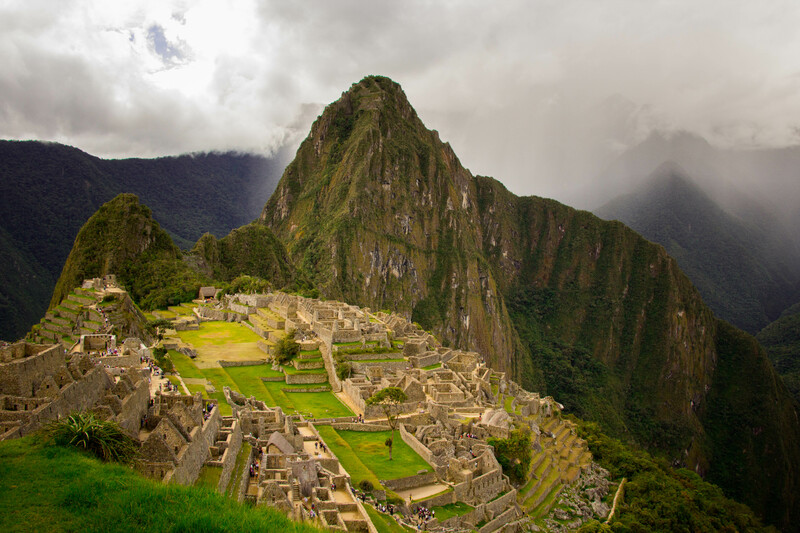 Peru does not require any immunizations for entry, but the Center for Disease Control and Prevention (CDC) recommends Hepatitis A and Typhoid for travelers going to Peru. You can find all this, as well as more information pertaining to health precautions such as safe food and water practices, on the CDC website. Visa Entry/Exit Requirements: If you’re a U.S. citizen, you need a current passport that’s valid at least SIX months after the date you plan to return with at least one black page. If your passport expires before November 2018, you’ll need to renew it. If you’re a U.S. citizen, you do not need a visa to travel to Peru for stays up to 183 days. If you’re not from the U.S., check with the Peruvian consulate for your country details. Money: Peruvian sol is the currency used in Peru. You’ll get the best exchange rate if you use your credit card for purchases and meals and your debit card in an ATM to withdraw cash (almost all ATMs have screens in English). Check with your bank before you leave to make sure your card will work in Peru. Electrical: Peru’s electrical system operates at 220 volts and has a frequency of 60 hertz. Some places in Peru will take the standard US two-prong plug, and others need a “Type C” with the two round prongs. Bring a Type C adapter (and possibly a converter) for your equipment. Almost all laptops and camera battery chargers have an electricity converter built in to the power cord (that means you don’t need a converter). In Peru, you can expect long days with A LOT of walking—often up and down hills, on irregular stairs, and over uneven terrain. You should have the ability to walk comfortably for two miles and/or for at least an hour in these conditions. Also, keep in mind the elevation in Cusco is over 11,000 feet. That’s higher than many mountain summits. I HIGHLY recommend arriving a couple days early to get used to this elevation. If you are unable to keep up with the group, please understand that you might not be able to participate in an activity. If you have concerns about physical limitations, please contact a Great Escape Publishing staff member before registering. You can email us at workshops@greatescapepublishing.com or call (561) 860-8266. Please note: Peru is a very poor country so it is dangerous (and in bad taste) to show off expensive jewelry, designer clothes, etc. There is no need for dressy clothing—it is a very casual place. Prerequisites: All skill and experience levels are welcome, and the concepts introduced are doable by anyone. Point-and-shoot cameras or smartphones are welcome but classes will be geared around DSLR cameras. If your camera is new, it is helpful to become familiar with it before the expedition. We’ll send you a camera basics class before the workshop begins. But, don’t worry, we will do our best to get you comfortable with your camera by the end of your time with us. Space is limited to just 12 attendees on this trip, so I strongly urge you to sign up today. It could be years before you get another opportunity to explore Peru with such a small group of like-minded people—and, with an expert photographer (who knows this country inside and out) by your side! So please, register here now by clicking below or, if you have any questions, call our office today at (561) 860-8266 (Eastern time zone). P.S. If you love to travel and have an interest in photography, you have what it takes to become a successful freelance travel photographer. It’s that easy. The many successful folks who have attended one of our workshops in the past don’t do anything you can’t learn to do. NOTE: You may qualify for additional discounts on this expedition. Click below on the Register Today button for details or call our office at (561) 860-8266 to find out how much you can save. Cancellation Policy: All our workshops and expeditions are non-refundable. If, however, you are unable to attend due to unforeseen circumstances—and you give us at least 60 days’ notice—we will be happy to apply your payment toward a future workshop, minus a $300 processing fee. If you cancel due to reasons that are covered by your purchased travel-insurance policy, we will advise the insurance company that your travel and conference fees are non-refundable.